Jussie Smollett attends the Trevor Project’s TrevorLIVE LA 2018 on December 3, 2018 in Beverly Hills, California. Empire co-executive producer Danny Strong issued an official statement in response to the disgusting incident on Twitter. Thankfully, he called a thing a thing. This is racist and homophobic. Additionally, several celebrities have taken to social media to express their support, including Lena Waithe, Justin Simien and Kerry Washington. David Johns, executive director of the National Black Justice Coalition (NBJC) issued an official statement on the matter. Black LGBTQ and same-gender-loving people, especially Black Trans women, face insurmountable challenges to living full lives. As we engage in the human rights work of advocating for protections of Black lives we must ensure we’re holding space for and ensuring protections for those of us with intersectional identities. If nothing else, these hateful demonstrations of policies and practices designed to destroy our communities should be a reminder that if they come for some of us in the morning they will come for the rest of us at night. In this moment in history, we must all work better together to combat the ignorance, hatred, and violence Black LGBTQ people face, and we need our governments and our elected officials to start condemning it openly and to fight back with transformative policy too. You can read the full statement at NBJC.org. 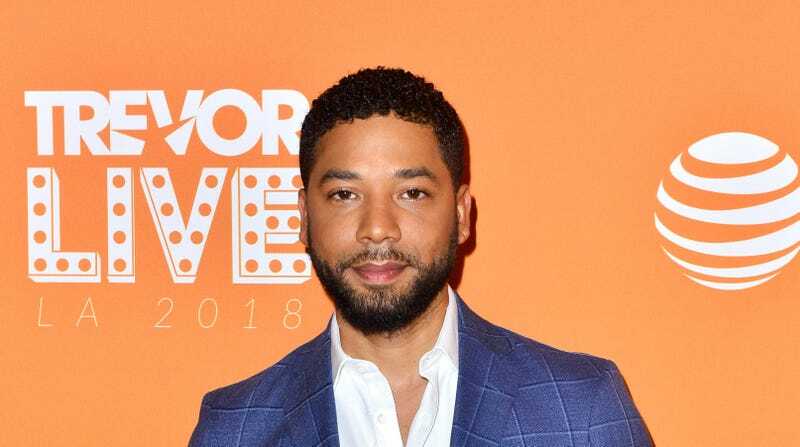 TMZ has spoken with the Chicago Police Department and confirmed Smollett followed up with them with key updates. Firstly, the Empire actor directly claimed the validity of “MAGA country” comment report. Second, Smollett reportedly still had the noose around his neck at around 2:42 a.m. when the CPD made contact with him. In addition to the recently announced FBI investigation, police are looking into Target department store external surveillance footage they recently obtained, showing someone who is presumably Smollett walking down the street. CPD has also requested footage from a nearby apartment building. Chicago Police gave an update Wednesday morning stating that they have reviewed hundreds of hours of downtown surveillance camera footage from the night of the alleged incident and have yet to find a video account of the attack, per FOX Chicago. A few more notable people have released statements on the matter, including U.S. Representative Bobby L. Rush (D-IL) and Color of Change president Rashad Robinson. We stand with Jussie Smollett, who was targeted for living his life unapologetically as a Black, gay man. This attack is personal for us: Jussie has been a powerful advocate for marginalized communities. Color Of Change is in contact with Cook County State’s Attorney Kim Foxx on this matter as our hope is to ensure that federal and local prosecutors conduct a full and transparent investigation. All efforts must be put towards finding those who committed this act of violence and bringing them to justice. The violent attack on Jussie is a frightening reminder of the white supremacy and homophobia rampant in our country, as well as the consequences of enabling hateful rhetoric with collective silence. We should remember that his attack is not an isolated incident. Violence against Black, LGBTQ, and those at the intersection happens every day and is increasing yearly. For those living at the intersection of Black and LGBTQ identities, discrimination and violence is compounded. We may not know their names, but there are many more people who live under the threat of violence and even death simply for being and embracing who they are. As reports continue to unfold, our hearts hurt to be reminded, yet again, of the hate and the pain that characterizes the Black experience in America. We will not be silenced, and as the largest online racial justice group with 1.4 million members, we won’t stop fighting for justice. Rep. Rush wrote a letter directly to FBI Director Christopher Wray calling for immediate action.